This comprehensive workshop manual is the same manual issued by Jensen to their dealers and technicians. Suitable for the home workshop mechanic or professional technician this manual will help you maintain and your Jensen. Very easy step by step instructions with lots of diagrams. Please note: this manual does not cover engine maintenance and rebuilding. For information on engine maintenance and rebuilding please consult the relevant Chrysler manuals. Some photos and text are not 100% due to the quality of the original document, however, everything is readable. 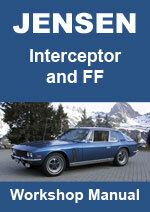 Jensen Interceptor Mark 2, 3 and FF Workshop Service Repair Manual $19.99 Immediate Download!